Michael Parekowhai's objects and installations are meticulously crafted according to his specifications and range from 'Patriot: ten guitars' (1999) to a restored 1962 VW Kombi in the middle of a synthetic pine plantation for 'The big O.E.' (2006). The works also reference language, humour and notions of Māori identity. Their glossy visual beauty and recognisability give Parekowhai's works popular appeal. In some works he pays tribute to, but also questions, New Zealand art 'greats', notably Colin McCahon and Gordon Walters. Parekowhai enjoys considerable kudos in the contemporary art world, having developed an extensive exhibition history. In 2011 he was selected as New Zealand's official representative at the Venice Biennale. Two major works from this presentation were subsequently acquired for public collections in New Zealand, 'Chapman's Homer' by Christchurch Art Gallery and 'He kōrero pūrākau mo te awanui o te motu: story of a New Zealand river' by Te Papa Tongarewa. 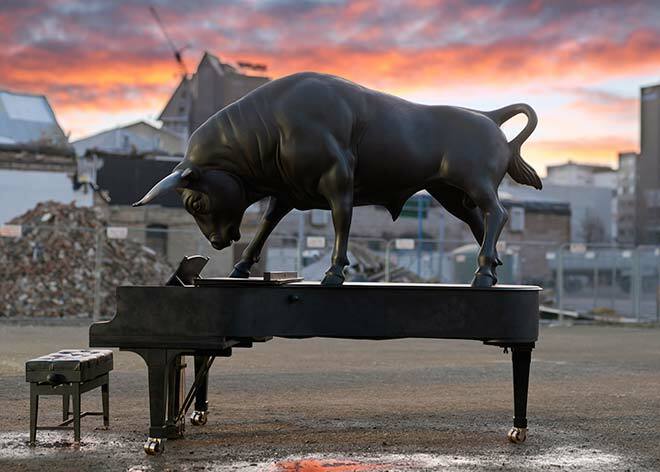 Courtesy of Michael Parekowhai and Michael Lett, Auckland. Photograph by John Collie.